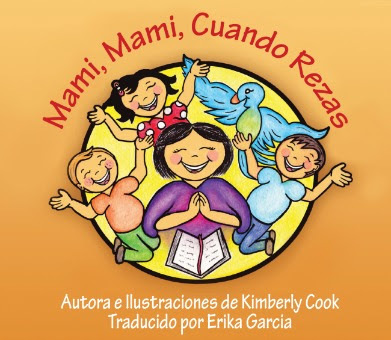 It was my pleasure to introduce my kids to Kimberly Cook’s delightful little book Mami, Mami, Cuando Rezas — the Spanish-language translation of her book Mommy, Mommy, When You Pray. It provided me with the perfect opportunity to make headway on my New Year’s resolution to teach our kids more Spanish! Mami, Mami, Cuando Rezas is a picture book of about 25 pages. The amazingly talented author also illustrated it herself. The color palette is a vibrant mix of turquoise, purple, and a sunny golden yellow, with some red thrown in for emphasis. Using just a sentence per page, the author explains how she prays constantly in gratitude for the wonderful children that God has given her — a terrific message for any child to hear. Spanish is becoming more and more important for our kids to learn, as the number of Spanish speakers in the United States increases year to year. In 2010, the number had reached 37 million. Approximately 30 million of those people are Catholic. Surprisingly, given such a large population, it’s hard to find Spanish-language kids’ books with religious themes. That’s what makes Mami, Mami, Cuando Rezas truly a treasure. Originally published at Can We Cana. Karee Santos is the founder of the Can We Cana? blog and also has written for Catholic Match Institute, Catholic Digest, National Catholic Register, and CatholicMom.com. Together with her husband Manuel Santos, M.D., she co-authored The Four Keys to Everlasting Love: How Your Catholic Marriage Can Bring You Joy for a Lifetime (Ave Maria Press, 2016). The Santos’s designed and taught a pre-Cana marriage preparation course, and they write a monthly marriage advice column on CatholicMom.com called “Marriage Rx.” They also contribute to FAITH magazine's “Your Marriage Matters” advice column. The couple live in Long Island, New York, with their six children.